Health on the cheap: Buying in bulk. – helping women with Lupus reclaim their health. Health on the cheap: Buying in bulk. Part of the cost of moving to a more nutrient-dense diet is the increased cost of dried goods. Brown rice cost more than white pasta, quinoa cost more than rice, and nuts are just plain expensive. Even adding in new herbs and spices can set you back a pretty penny. However, this does not have to be the case. More and more grocery stores are incorporating bulk sections. Here in Austin, you can find a bulk section at the local co-op or even in the main chain grocery store. Which is probably not surprising given Austin’s crunchy reputation. But just recently on a trip home to my very not-crunchy hometown of Odessa, Texas, I found a pretty well-stocked bulk section. This leads me to believe that bulk sections are becoming more mainstream. And it’s a good thing too. Buying in bulk allows you to buy just the amount you want. I love this for a few reasons. First, I’m not always sure how I will like something. If I can buy a cup of a new grain or a few teaspoons of a new spice, then it gives me the freedom to stretch my recipe arsenal without spending a bunch of money on items that are just going to take up room in my pantry. Secondly, I love fresh spices. Spices get old. Did you know that? Well, they do. And when they get old, they lose their flavor. Buying spices in bulk allows me to always have cheap, fresh spices on hand, often for only a few cents each shopping trip. Third, I love bulk because it does away with that .035768 serving that is always left in the bag. You know what I’m talking about? The manufacturers’ inability to fill their bags with a round number of whole serving sizes, so you get just a bit leftover. It annoys me! Finally, buying in bulk allows me to buy the highest quality of items. Organic, sprouted rice is pretty expensive if you are buying it off the shelf, but buying the two cups I need for that week in the bulk section is very doable. I’ve been buying in bulk for years now, starting in grad school. I was a poor, poor student in need of some nuts and grains, but didn’t have the cash or the need to buy off the shelf. Since that time I’ve picked up some helpful pointers. Don’t be intimidated: It took me a long time to feel comfortable buying in bulk. It’s a self-service process without a lot of clear direction. Here is what you need to know. There will be a bag of some kind, a scoop, and a way to seal and identify. Find the bag, use the scoop provided (usually attached the bin of your choice) to fill the bag with the serving size you want, and then tie it off and write down the code provided on the bin. Occasionally, you will have electric scales that print out a weight along with the price. I like these, but more often than not you will find a sticker to write down the product information or the tie is meant to be the identifier so you write the number and name on that. Do try that weird grain: Take some time to really explore the bulk section. 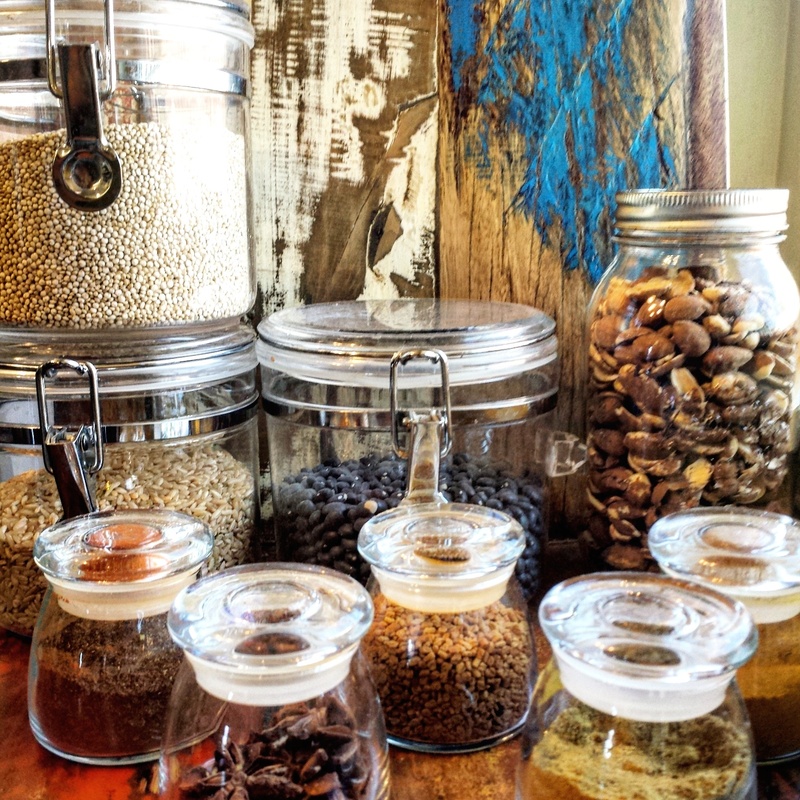 You are going to find flours, nuts, beans, grains, and maybe even dried fruit that you haven’t used before. Getting a cup or a half a cup of most things isn’t going to set you back much so buy it and experiment. For instance, a box of quinoa is going to run you around $6 and give you something 7.035768 servings. What if you make one serving and you hate it? Buying in bulk allows you to buy just the amount you want to try without committing more money and space than you would like. If you like it, you have a new ingredient to work with, if not you are out very little money and have gained some real insight about yourself. Go nuts in the spice and herb section. The best deal in the grocery store is the bulk spices and herbs. They literally weigh nothing, so while some fancy chili powder might say $12 a pound you are never going to pay anything near that. The last time I bought star anise I paid $.57 for an amount that will last for several pots of Pho. While a bottle of spices off the shelve might run you anywhere from $3 to $5, buying what you need from the bulk section is almost always going to be well under a dollar. So now is the time to pull out those recipes you have been putting off because they called for 5 or more spices. Bulk really has been a great way for me to provide nutrient-dense food to my family for very little money. I hope this has inspired you to got out there and explore the bulk section of your store for yourself! For more tips on living healthy on the cheap, check out Health on the Cheap: Have a plan! , Health on the Cheap: Eat all the produce! , Health on the Cheap: Use every bit!, and Health on the Cheap: Clean cheap and healthy. PS Let me know in the comments if you have any questions about living healthy on a budget, and I’ll do my best to answer them.